Hedges have a lot to offer when it comes to landscape design. You can choose from a variety of different shrubs and plants that can enhance the appearance of the property, and hedges can work well for providing privacy and marking boundaries. While many homeowners desire nice, well-formed hedges on their property, there is a lot to consider before buying and planting them in the yard. You need to select the right type of shrubs, learn how to plant and maintain them, and be sure to get the best battery powered or electric hedge trimmer for working on the type you have. This post is going to cover some of the finer points relating to picking the right hedges, planting them, and effectively trimming with battery powered hedge clippers. This comes down to choosing between formal or informal hedges, deciduous or evergreen, and maintaining them by planting closely together, using a hedge trimmer at the right time, and taking your time while trimming. Selecting the right shrubs is one of the most difficult parts of adding boundary hedges to a property. You have several different plant species that could work, but there are also some considerations that will determine the correct type for a given situation. One of the first things to decide is whether you want formal or informal hedges. With a formal hedge design, you have hedges that are more shaped and often intertwined to create a solid row of greenery. With informal design, the hedges do not intertwine, and they are allowed to grow in a more natural shape. Some plants can work well both formally and informally, but there are some that really only suit one style or the other. You also have to choose between deciduous plants and evergreens. Deciduous hedges can be good if you want the space to open up during the colder months of the year, but if you are looking for year-round privacy, evergreens are the better option. Keep in mind, too, that you’ll need to use your electric or battery powered hedge trimmer year round if you go with evergreen. Height can be an important consideration depending on your reasons for planting hedges. If you want the plants to provide privacy or act as a wind barrier, you will need to select taller plants. If you are simply setting a boundary or need visibility beyond the hedge, you should select smaller plants. You need to think about some of the environmental conditions on the property before selecting shrubs. Some plants might not grow well in certain types of soil. You also want to consider the climate, the amount of sun the plants will receive, and whether there are any invasive pests that could negatively impact different plant varieties. If you have selected hedges that are well suited to your objectives and property, care and maintenance will much be easier. For the most part, you will just need a set of pruning shears and an electric or battery powered hedge trimmer like the 20V Cordless 20” Hedge Trimmer. The plants that make up a hedge are supposed to be planted close to each other. When determining the exact distance, you need to consider the size of the plants and the style of hedge you are trying to create. Generally, larger hedge plants should be planted a little further apart while smaller plants should be closer. Most plants should be trimmed at the end of winter or early spring, but this can vary depending on the type of plants you choose. Make sure to learn about the growing season of your hedges and the correct time of year to use your shears and electric or battery powered hedge trimmer on the plants. 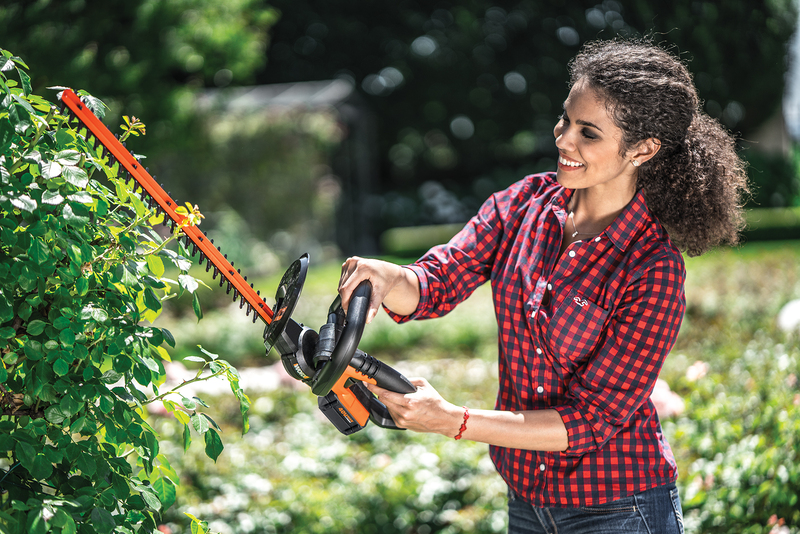 You are going to want to use your pruning shears to remove any dead or diseased limbs before getting started with your battery powered hedge clippers. Once you are done pruning, trimming and shaping the hedges can be made easy with a tool like the 56V Cordless 24” Hedge Trimmer. When trimming hedges with the best battery powered hedge trimmer or electric model, you want to try to keep the plants slightly narrower at the top than they are at the bottom. This will allow sun to reach the lower areas of the plant, and help to ensure better growth. Take your time when trimming and let your battery powered hedge trimmer do most of the work. If you get too aggressive or use too much force, you could end up damaging the plant or cutting away more than you intended. Although it may not seem like it, choosing and maintaining a hedge is relatively simple once you get down to it. While it’s important to pick the right plants and best battery powered or electric hedge trimmer possible, you also need to apply a bit of research and attention to be able to have the hedge of your dreams. Make sure you’re trimming your hedges with a tool that offers the ultimate accuracy and precision. Shop the WORX collection of battery powered and electric hedge trimmers. Choosing between formal or informal hedges, deciduous or evergreen, and maintaining them by planting closely together, using a hedge trimmer at the right time, and taking your time while trimming.